Mechanical upgrades: Updated wiring on breakers, forced air gas furnace 2008, central air conditioning, mostly thermo pane windows, pot lights! Gas Hot Water tank 2008 rental. Great opportunity for a growing family ! 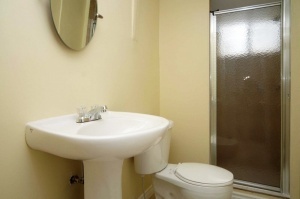 Recently upgraded throughout including new bathrooms on all 3 levels . Quiet dead end street yet steps to shops, transit & parks. Amazing value for a move-in ready home – Attention first time buyers! 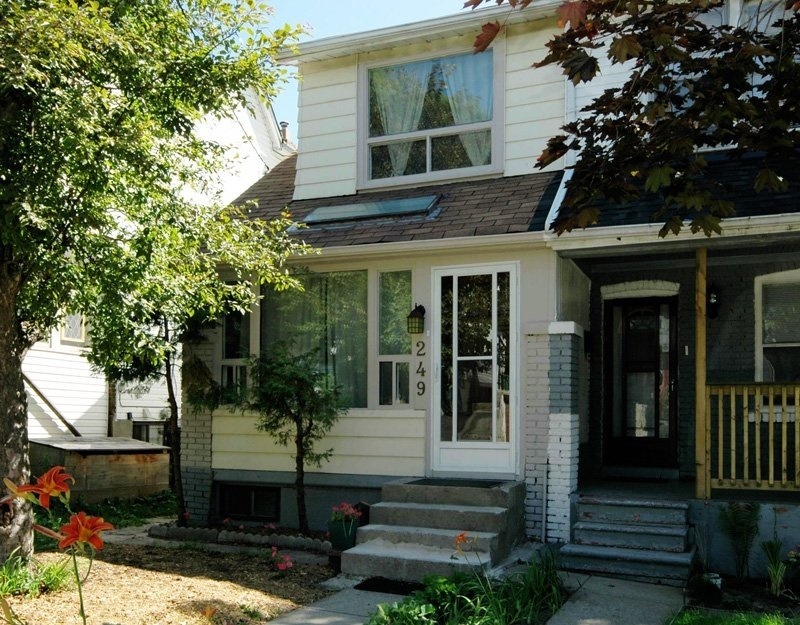 This home is located north of Gerrard between Greenwood & Coxwell in an upcoming area of the trendy Leslieville neighbourhood. Quiet dead end street is ideal for kids playing or pets. 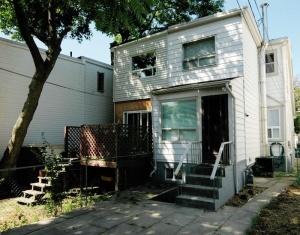 The location is surprisingly serene considering its close proximity to downtown Toronto. Much desired ability to walk to shopping including the vibrant Gerrard Street East “India Bazaar” an exotic array of retail stores, restaurants and food stores. Go green – lots of TTC and Public transit routes connecting to downtown via streetcar and north to Danforth subway line via Greenwood bus, or bike downtown. Walk your dog or play sports in nearby Greenwood Park only a few blocks away – which features baseball diamonds, a pool, and artificial ice rink. Attend nearby the S.H. Armstrong Community Recreation Centre on Woodfield Road for a gym, pool, fitness programming and meeting space. Run or bike along the Martin Goodman trail into the Beaches or up the Don. 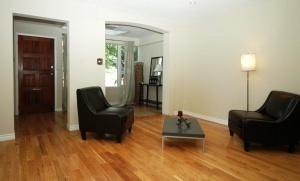 Friendly neighbourhood with mix of families, young professionals, older established owners. Great for entertaining & Family life! 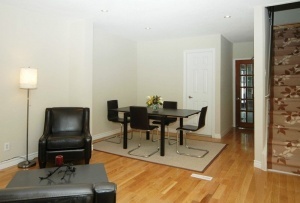 Smart layout, open concept principal rooms with hardwood floors, numerous pot lights and plenty of natural light. Tasteful décor in warm neutrals & new light fixtures. Professionally painted interior & exterior 2009. 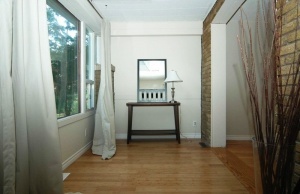 Extra den/sunroom on the main level with skylight, exposed brick & bamboo flooring. 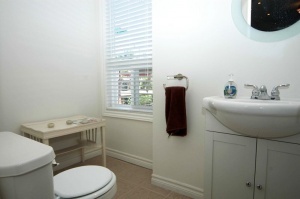 Rare main floor powder room, renovated 2009. Spacious upgraded kitchen with new porcelain tiled floor, plenty of cabinets, space for a breaky table plus stainless steel appliances and a walk out to rear yard. 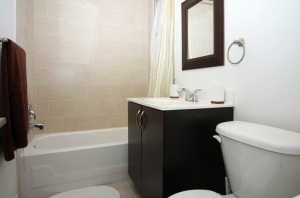 Designer four piece bath, with warm earth toned tiling and décor, and a dark wood vanity and modern fixtures new 2009 . 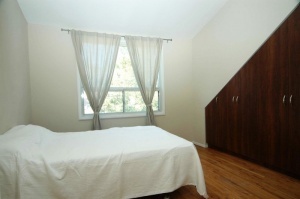 Sunny master bedroom features hardwood floors and new custom built in closet & shelves. 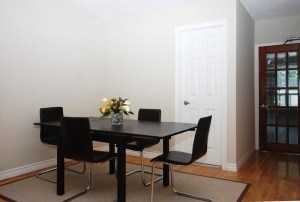 Fully finished basement with separate entrance for potential rental or nanny suite. 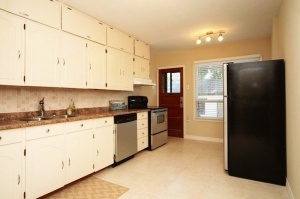 Kitchen area with cabinets & sink in rear current laundry room. New 3 piece bathroom. Large storage room. 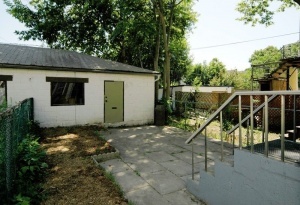 Low maintenance yard – fenced in with patio stones out back. Garage fits two cars off lane. Updated mechanicals include wiring, forced air gas furnace ’08, Central air conditioning & mostly thermopane windows.